She's an android assassin made to look like a supermodel. He's a cocky billionaire trying to make the world safer. Together they'll have to face a common enemy in this thrilling L.A. sci-fi noir series. 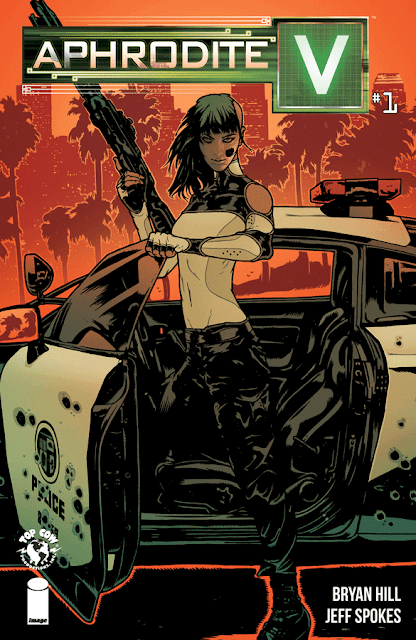 Top Cow's Cyber Force universe gets an exciting new entry when Aphrodite V hits Los Angeles. The latest iteration of the cyborg assassin wants to be the last and has gone rogue from her masters to make sure she survives. In the midst of a major terrorist attack, tech genius billionaire Martin Carver has a plan to bring justice and safety to the city. He's being targeted by an unknown assailant and Aphrodite might be his only chance to stay alive. Bryan Hill is one of the busiest writers in comics. Among the books he's working on are the aforementioned Cyber Force and Bonehead for Top Cow/Image. He's no stranger to science fiction or cyberpunk storytelling. In Aphrodite V, he touches on futuristic technology including sentient androids but the star of issue one is the all-too-human Carver. Carver embodies the self-assured and brilliant billionaires we know today except for being a lot more philanthropic. He wants to privatize the Los Angeles Police Department to help streamline the force, improving morale, pay, and response times. The plan doesn't impress the powers that be but he remains determined. Meanwhile, he's got other problems because someone is out to get him. Hill's movie influences from RoboCop to Heat and even Terminator are evident in style and content. It's a nod to those great films but Hill's approach, especially with Carver, is very much character-driven. When Carver meets V for the first time he's more curious than fearful. He has an unyielding need to know and that may be why he's been targeted. Jeff Spokes delivers a taut tech thriller with a stylish neo-noir look. The characters and action in the foreground are shadowy and dark juxtaposed against varied bright colored backgrounds. The only time things get a little confusing is during the firefight in the street where the fight sequence gets a bit muddled. Overall, Spokes artwork is excellent and brings to mind films like Blade Runner and The Matrix. 'Aphrodite V' is a great introduction into a much larger story. It will whet your appetite for more great sci-fi action and intrigue. Hill and Spokes have a keen eye for storytelling that honors the genre but forges something new and exciting. It's a strong debut that's well worth the read.